The Swiss Champion Calanda Broncos has awarded by the EFAF Board of Directors to host and organize the European Football League Final, the EUROBOWL XXVI against Vienna Vikings. 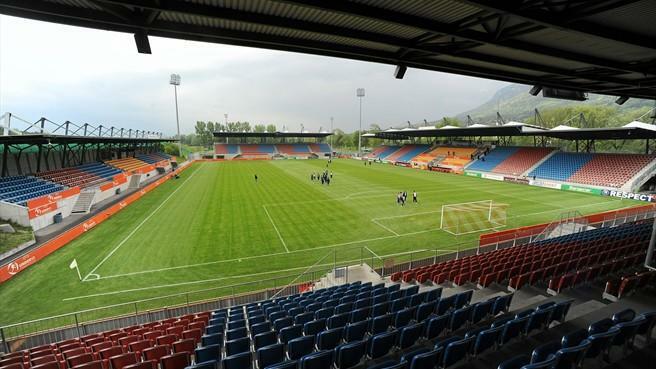 The game will be played at the Stadium Rheinpark Vaduz in the capital of Liechtenstein. Eurosport 2 already confirmed to provide first time ever live coverage EUROBOWL - EFL championship game. With that coverage EUROBOWL will be brought to all American Football fans in whole Europe. The Rheinpark stadium in Vaduz (Liechtenstein), which is located 29 air km away from our hometown in Chur (25 minute car ride), right at the boarder to Switzerland with an awesome mountain sight around and right in front of the sovereign castle of Liechtenstein. Rheinpark stadium is an internationally approved stadium and hosts all the international UEFA/FIFA soccer games of Liechtenstein. The stadium has a fully seated capacity of 6,127, almost all of them roofed on all four sides of the stadium: Sektor 1 (Main stands): 2'684 (inkl. media, observer und handicapped places), Sektor 3 (Facing stands): 970 (inkl. media places), Sektor 2 (South stands): 1'232, Sektor 4 (North stands): 1'241. The stadium has additional standing places giving it a total capacity of 7,789. Calanda Broncos expects to bring at least 2000 fans from Chur to Vaduz, with probably 1000 more fans from football communities within reach and at least 1000 spectators who have never seen a game before. Together with the anticipated fans from Vienna we are positive to have a crowd of more than 5000. The surface is natural grass with a field size of 105 m x 68 m. The stadium is located right at the highway A13 exit Vaduz, right next to the Rhine. The next bigger football towns and big cities Hohenems (39 km), Zurich (110 km), Innsbruck (172 km), Munich (237 km), Stuttgart an Milano (each 260 km) are all within driving distance (maximum 3 hour ride). The next international airport is located in St.Gallen-Altenrhein, 53 highway kilometers away from Vaduz, the next big airport is Zurich (110 km away). EFAF President Robert Huber commented the decision: "After eight successful EUROBOWLS in Austria in a row we are turning a new page in the history of American Football Europe. It is the first time ever that a Swiss team participates in the EUROBOWL - EFL championship game. It is the first time that the EUROBOWL is organized by a Swiss team and also the first time that Eurosport covers one of our EFL games at all." "We - the whole team of the Calanda Broncos - are really proud to be trusted to organize this unique event", said Calanda Broncos President Walter Tribolet. "We are well aware of the great honor and we will do everything possible to deliver an high class event."